One of the greatest attractions along the coast of Arctic Norway is the numerous breeding hotspots for seabirds. The Northern gannet is one of the species: A rather big, beautiful, and again, bountiful seabird. Close to North Cape, it has become one of the feature attractions at the Gjesværstappan Nature Reserve. And it has just arrived. The local people of Gjesvær observed the gannet at the nature reserve (Storstappen) in 1987 and scientist Robert Barrett logged it in 1988. The number of gannets exploded exponentially in the following years. The regal white bird has been monitored, counted, ringed and also been outfitted with electronic devices in order to uncover the secrets of this powerful bird. The gannet can be a meter long from tip to tip, bill to tail. The wingspan of almost two meters produces buoyancy for a large fishing area. From vertical 40 meters, it can plunge head first at the seabed for a swift catch at 24 meters depth (Ropert-Coudert et al – 2009). The bird is a horse kick muscle. The bill is a corporeal arrow. For man, it can be bloody work to handle. Unfortunately, ringing birds is important work not limited to sparrows. Different gannets are interacting with each other. In 1987, it is believed that the first pair settling Gjesværstappan came from Lofoten. The new colony at Gjesværstappan rose simultaneously with the fall of the colonies at Hovsflesa and Skarvklakken. Ringed birds from Bass Rock in Scotland and Iceland have been located in Gjesvær. Modern-day gannets were spotted in Murmansk, Russia for the first time in 1996. They had been ringed at Gjesværstappan. To keep track of birds is vital. Birds are important to life. First, at Runde in 1947. These birds probably came from the British Isles and Iceland. In 1967, the gannet re-established itself in the Lofoten area. 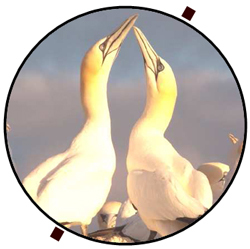 Another couple of decades, Finnmark – including Gjesværstappan – would start to host the gannet. The number of gannets in Norway is estimated to be 4 500 pairs, of which one quarter residing at Gjesværstappan Nature Reserve. 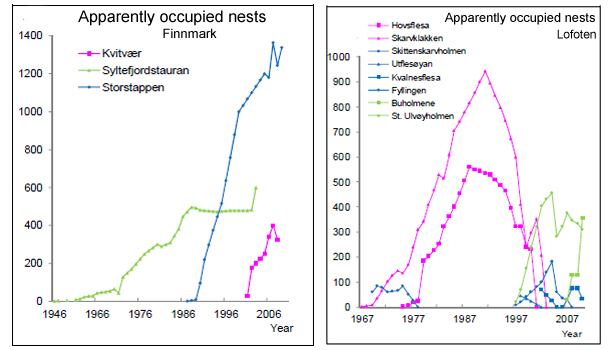 Historical world population of Northern gannets (Morus bassanus). (Nelson 2002 / Birdlife International 2011 / Emeline PETTEX 2011). Most Norwegian gannets spend the bad season in the Bay of Biscay, the English Channel and the North Sea. Few brave guys reach Mauritania and Senegal. On their migration path between the Arctic and Northwest Africa the gannet interacts with most of the global gannet population. The breeding gannet can be found in the North Atlantic from the coast of Murmansk, Russia to Québec, Canada. The world population of gannets were 50 000 breeding pairs in the early 20th century. 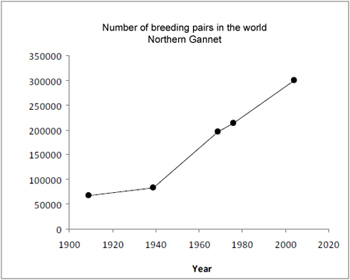 The population in 2000 was estimated to be more than 350 000 pairs. You should make a note: The colony at North Cape is possible the easiest accessible for people interested in observing wildlife. Do you know any other sites where you can watch the Northern gannet? The seabirds at Gjesværstappan is a surprising attraction at North Cape. In a series with three blog post you can fly into the life of the beautiful gannet.